Students transfer for many reasons. We provide a very simple Transfer process in just two steps. 1. Application - Please fill out the form below and provide a copy of your Belt Certificate and a short Martial Arts Training Bio, Martial Arts School and Former Instructor Contact Info. 2. Action - We will contact you to schedule a One on One Assessment Session with our Head Master to evaluate your level of proficiency according to your rank and plan for a smooth transition into our programs. *US World Class Taekwondo reserves the right to decline a transfer request at any time. 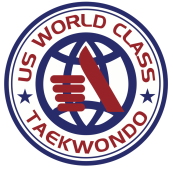 US World Class Taekwondo is a Kukkiwon Certified Martial Arts Academy affiliated with USA Taekwondo, the national governing body of Olympic Taekwondo in United States. The World Taekwondo Academy ( Kukkiwon) maintains an international database on ranking and sets the standards for the Training Methodology and Grading. US World Class Taekwondo has a direct link with the World Taekwondo Headquarters in Seoul, Korea. We honor Rank Certificates endorsed by fellow Kukkiwon Certified Masters / Schools worldwide. Students Non - Kukkiwon Certified or other Non Affiliated American Martial Arts Schools. We understand how much time and work you put into achieving your goals. We welcome you and we promise to honor your hard work. Therefore we look forward to meeting with you and find the best options available to get you back on track. Re-certification is required for Non - Kukkiwon Certified Black Belts looking into joining our Academy. Re-Certification is scheduled twice a year and the Fee is $145. Re-certification process - Student is approved to join our school at his / her present rank and presented a learning plan to meet the US World Class Taekwondo requirements. The student will be required to demonstrate proficiency and knowledge of US World Class Taekwondo Curriculum.